Malta-based crypto exchange OKEx has announced the listing of four new tokens on margin trading platform. 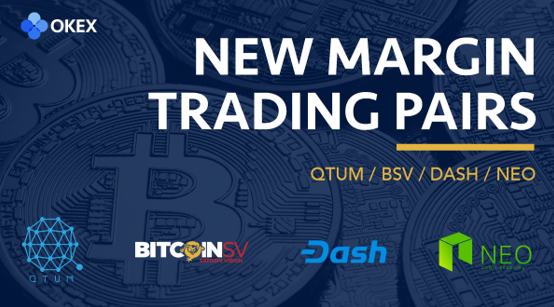 Users can now trade QTUM, Bitcoin SV, Dash and NEO against USDT or BTC with a 3x leverage option. Additionally, OK PiggyBank, a tool that allows users to earn daily interest on their spare crypto, has stated that it will also support the new pairs. OK PiggyBank is available to all OKEx users and has no minimum deposit requirement. At the end of last month OKEx announced the addition of two new fiat currencies to their OTC trading platform – the British Pound and the Thai Baht, with plans to add further fiat currencies in the future. Then, several weeks later, OKEx CEO Tim Byun elaborated on the exchange’s plans of expanding into Japan after recently setting up shop in Malta, which saw the OKEx partner with the Malta Stock Exchange. All margin pairs with Tether are rather interesting for traders. The more margin pairs the better for users. The more pairs with Tether the more possible profit.